Back in November, The Sche Report picked out Snakeskin and Leopard prints as two leading Spring 2011 trends based on what we saw on the runway. Just when I thought the industry might have overlooked this trend for Spring, Vogue‘s June issue ran a 6 pages editorial with Lara Stone featuring this season’s hottest Snakeskin and Python accessories!! I love what I do and it is always encouraging and validating to know that Anna Wintour and the whole team at Vogue share the same vision as The Sche Report. Check out what we wrote about Predator Prints as a trend and then take a look at Lara’s stunning Vogue spread! And don’t forget that You Saw it Here First! If you are wanting to know the trends before they hit the magazines, stay tuned to The Sche Report! 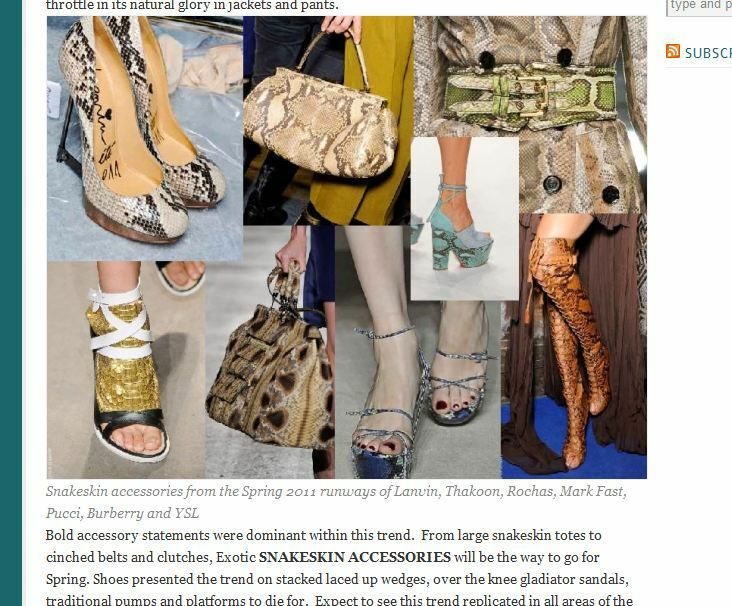 We called out Snakeskin accessories as a major category within the Predator Prints trend. We also called out Snakeskin garments, which saw coverage in all major publications all over the world this season. Stay tune for Friday’s “GET THE LOOK” post when I show you all my favorite Snakeskin pieces of Spring/Summer 2011! Follow The Sche Report on Twitter here to get the latest updates.